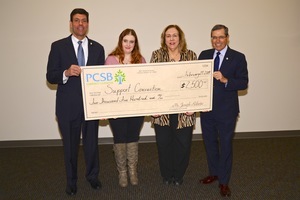 The PCSB Community Foundation recently donated $2,500 to Support Connection, a nonprofit organization based in Yorktown Heights that provides emotional, social and educational support to women, their families and friends affected by breast and ovarian cancer. The PCSB Community Foundation’s mission is to identify nonprofit organization within PCSB Bank’s Lower Hudson Valley footprint that need financial support and provide donations. PCSB Bank (www.pcsb.com) is a New York-chartered stock commercial bank serving customers since 1871. It operates from its executive offices/headquarters in Yorktown Heights and 15 branch offices located throughout Westchester, Putnam, Rockland and Dutchess Counties. Pictured (l to r): PCSB Senior Vice President of Retail Banking Officer & Director of Cash Management Services Dominick Petramale; Support Connection’s Development and Outreach Coordinator Melissa Higgins and Executive Director Katherine Quinn; and PCSB Chairman, President & CEO Joseph D. Roberto.